“Allegory of Venus and Cupid,” c. 1600, Imitator of Titian (Tiziano Vecellio, Italian, c. 1485/90-1576), oil on canvas, 51 1/8 x 61 1/8 in. (129.9 x 155.3 cm). Charles H. and Mary F.S. Worcester Collection, 1943.90. This pleasant if heavily-restored late 16th century allegorical painting in the collection of The Art Institute of Chicago is now called “Allegory of Venus and Cupid” and dated to around 1600. Attributed to an “imitator” of Titian it remains today in museum storage (“Not on Display”). When this same painting was “rediscovered” around 1930 it was hailed as a Titian masterpiece and over the next 15 years was talked of that way in the general press and in some quarters of the art press. It delighted crowds who came to see it hang on the walls of The Art Institute of Chicago and The Cleveland Museum of Art. Called then “The Education of Cupid” and dated to the 1550s, it was compared favorably with Titian’s famous allegorical subject paintings in Paris’s Louvre and in Rome’s Galleria Borghese. The painting, through the Great Depression and World War II, was labeled “Titian,” but among expert connoisseurs there existed a longstanding dismissal of that high attribution ever since its first known “resurfacing” in the mid1830s in Scotland at Gosford House. 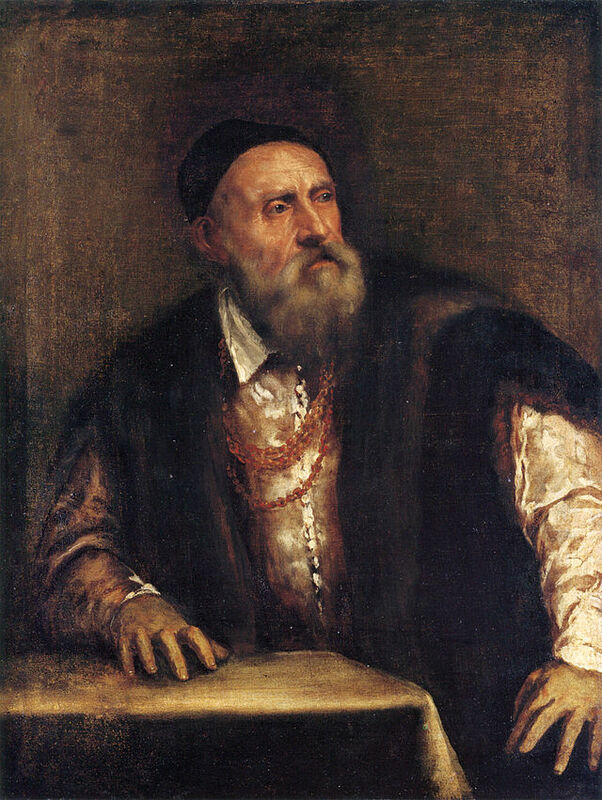 In Italian his name is Tiziano Vecellio, but he is famously known in English as Titian (1485-1576). He was part of a family of artists who, previously in the 13th and 14th centuries in Italy, had been civic leaders such as mayors, magistrates, and notaries. Offspring of two Vecellio brothers in the 15th century became artists. One of those brothers was ambassador to Venice and his grandsons became Venetian-trained painters (the family had a timber trade there). The younger grandson was the great Titian. Titian became the leading painter in Venice and an influential artist throughout 16th century Italy. His cousin Cesare Vecellio trained in Titian’s workshop and in spite of the fact that other Vecellio cousins and their sons became artists and were allowed to use the appellation “di Tiziano” which turned some heads – they, along with later followers of Titian, are now considered artistic mediocrities. Titian: Self portrait, c. 1550, Gemäldegalerie, Berlin. Today the painter of the Art Institute of Chicago’s allegory entitled “Allegory of Venus and Cupid” is only identified as an “imitator” of Titian. Its allegorical motifs share similarities with Titian’s and this is perhaps partly why this Old Master by an unknown follower of Titian was mistaken for the master himself when it resurfaced on the art market in 1927. Called then “The Education of Cupid” and dated to the 1550s, it traded back and forth to the dealer for almost a decade until it was bought in 1936 by a well-connected Chicago couple who collected 16th century Venetian paintings. The “Wemyss ‘Allegory’” (named for its former British owner, Lord Wemyss) came to Chicago out of what amounted to be a Scottish attic. It gained ready acclaim as a rediscovered Titian and since its subject was reminiscent of Titian’s “Allegory of Marriage” (1533) in the Louvre and a Titian subject allegory in the Galleria Borghese, the Wemyss “Allegory” in Chicago was hailed as completing a triumvirate of Titian’s greatest allegorical compositions. The problem was that the Chicago Titian was not a Titian at all – although it took about 10 years for that fact to gain modern acceptance. After the purchase, the new owners immediately lent their Titian to The Art Institute to mount on its gallery walls next to the collector couple’s Tintoretto, Veronese, and G.-B. Moroni. The museum eventually acquired the Wemyss “Allegory” in 1943, but not before it toured The Cleveland Museum of Art during their “Twentieth Anniversary Exhibition” in 1936 and was viewed with enthusiasm as a Titian. The collector purchase and subsequent loan to the Art Institute was front page news in Chicago. The director of the museum at the time, Robert Harshe, compared the work in importance to only two others in the Art Institute at that time – El Greco’s “Assumption of the Virgin” (1577-79) and Rembrandt’s “Girl at the Open Half Door” (1645). Soon after its acquisition by The Art Institute the Titian attribution was loudly critiqued in print and eventually dropped. The subject of the painting is of a girl who appears before Venus to be initiated into the mysteries of Love. At the girl’s right are Venus and the boy Cupid with an arrow. In the background one satyr raises a basket with two doves and another satyr raises a bundle of fruit. Allegories were popular in Italian Renaissance art to convey various social, political, economic and religious messages using historical and mythological figures. However, this painting’s figures appear to be derivative of specific Titian works. Further, it possesses little of the technical brilliance or psychological revelations found in Titian’s work such as in “Triple Mask or Allegory of Prudence” (c. 1570, London, National Gallery). For instance, Titian’s imitator gives the figure of the girl the same dramatic hand gesture found in Titian’s “Venus with a Mirror” (c. 1555, The National Gallery of Art, Washington, D.C. ) or, even earlier, “The Penitent Magdalene” (1531-33, Florence, Palazzo Pitti) insofar as the girl’s skyward gaze and flowing hair. What most connoisseurs recognized by 1945 – in addition to the painting’s derivative character of well-known Titian works – was what they called its “very modern” execution – precisely, its sharp color contrasts and figurative forms that only developed after Titian’s time. Connoisseurs further noted that Titian always differentiated sharply between hair and ornament and that his female figures’ hair is neatly braided – whereas in the Wemyss “Allegory” the hair is “in a mass.” Characteristics such as these pointed to the picture being less related to authentic Titians in Paris and Rome and more to ones attributed dubiously, even spuriously, to Titian in Munich and at the Durazzo Palace in Genoa. Yet this inauthenticity of Chicago’s Wemyss “Allegory” could have been questioned right at the start of its Chicago appearance in 1936 if the museum adhered more closely to the historical connoisseurship. Sir Joseph Archer Crowe by Louis Kolitz (German, 1845-1914), London, National Portrait Gallery. 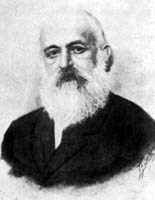 Giovanni Battista Cavalcaselle, 19th century. 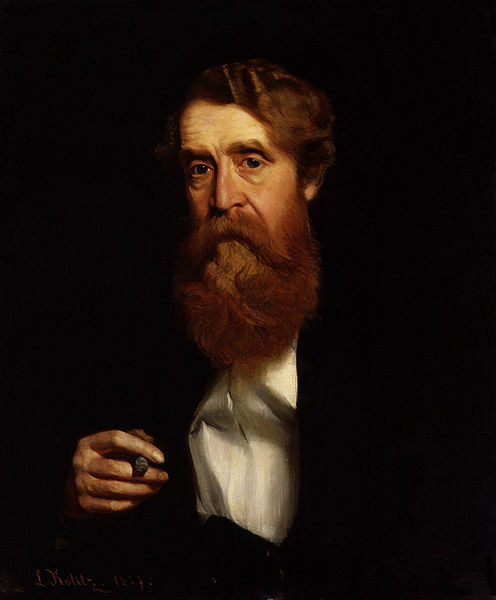 Sir Joseph Archer Crowe (British, 1825-1896) and Giovanni Battista Cavalcaselle (Italian, 1819-1897) had seen all three of the spuriously attributed Titians in Munich, Genoa, and, at the time, Gosford House which was now in Chicago. It was well known the pair excluded all three from their Titian catalog except to note that they were imitations which had been notably damaged and restored. Chicago museum research in the late 1930s was also aware of Crowe and Cavalcaselle’s attributive work for they cited them in official publications on the Wemyss “Allegory,” but they overlooked their conclusions. With the museum’s acquisition of the Wemyss “Allegory” in 1943 Crowe and Cavalcaselle’s negative attribution for it was no longer ignored or denied. About its reworking in England one tempting and likely wishful speculation was that the Wemyss “Allegory” was restored by Sir Joshua Reynolds (1723-1792) but that claim is unsubstantiated. Further facts contextualized in the deft historical hands of modern connoisseurship left the Wemyss “Allegory” out in the Titianesque cold as an imitator. In the case of the Chicago painting it was by historical comparison with compositional arrangements in known Titians that the compositional arrangements in the Munich and Chicago paintings were deemed by Crowe and Cavalcaselle to be done by imitators. Historically for Titian it would be nonsensical or “unique” for Titian to have manipulated the figures in that way at that time. By the mid1940s the Chicago painting was searching for a new name attribution, although Crowe and Cavalcaselle did not give it one. The notion that it was done by Damiano Mazza, an obscure 16th century artist and student of Titian, was proposed but later dismissed. Chatsworth, Duke of Devonshire: Van Dyck, Sketchbook. 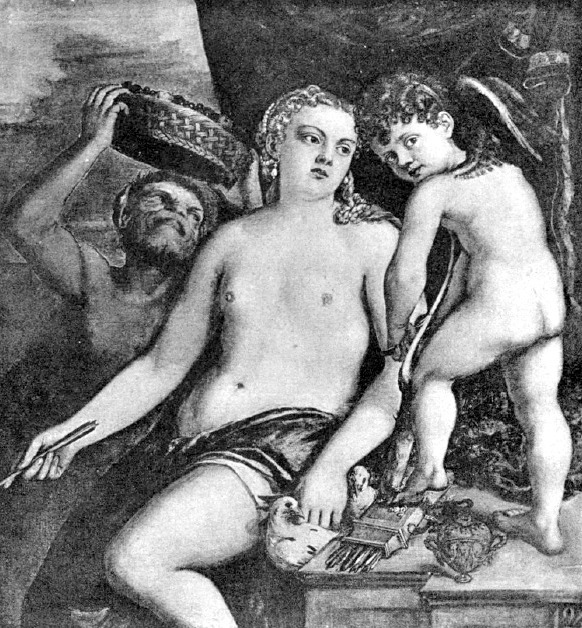 Rome, Galleria Borghese: Venus and Cupid with Satyr Carrying a Basket with Fruit, attributed to Paolo Veronese. 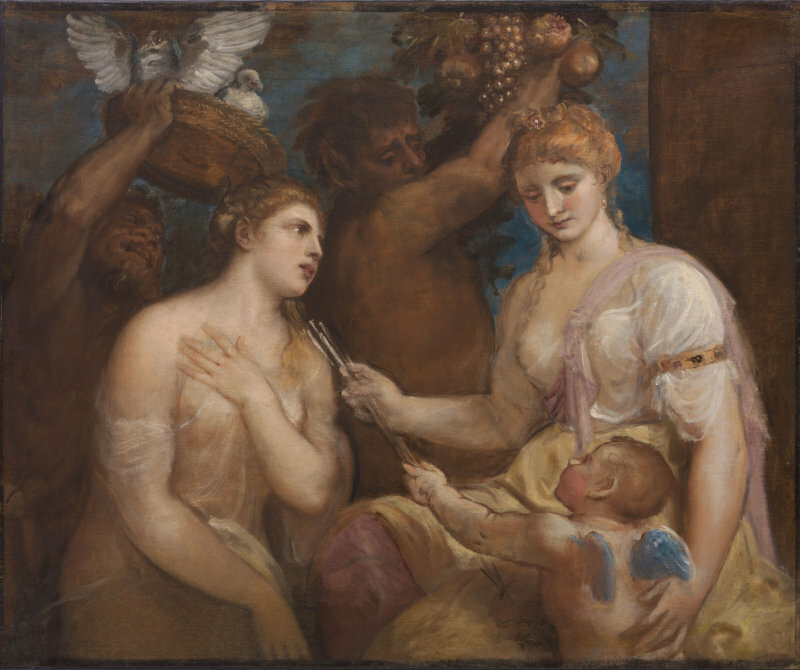 Some of the confusion over the attribution to Titian of the Wemyss “Allegory” is based on erring connections made using erring extant evidence. 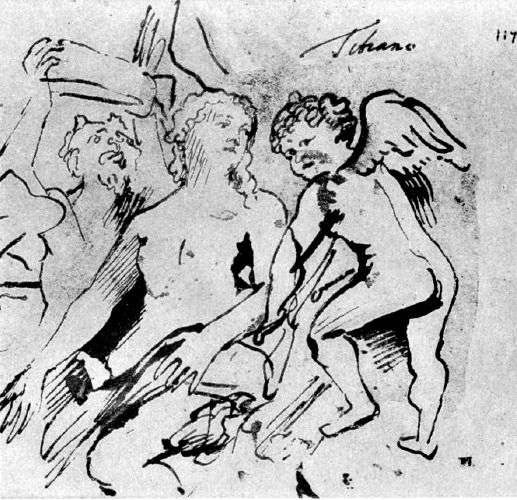 For example, the conjecture of Vienna School-trained art historian of Venetian art Hans Tietze (Czech, 1880-1954) that a sketch by Sir Anthony van Dyck (1599-1641) which Tietze wrongly believed was made at Chatsworth House of a painting once attributed to Titian was a sketch that shared similar motifs with the Wemyss “Allegory” is his thin thread for possible attribution to Titian. It can be argued that the Wemyss “Allegory” shares very little with the Van Dyck sketch except for the satyr lifting a basket and, further, the painting in question which Van Dyck sketched is no longer attributed to Titian and remains in the Galleria Borghese as a minor “Venus and Cupid with Satyr Carrying a Basket with Fruit” attributed to Paolo Veronese. It is in Rome where Van Dyck must have made his sketch, not England, and it was there he mislabeled it as Titian – and this misleading evidence became the key to prompt a connoisseur’s train of thought. 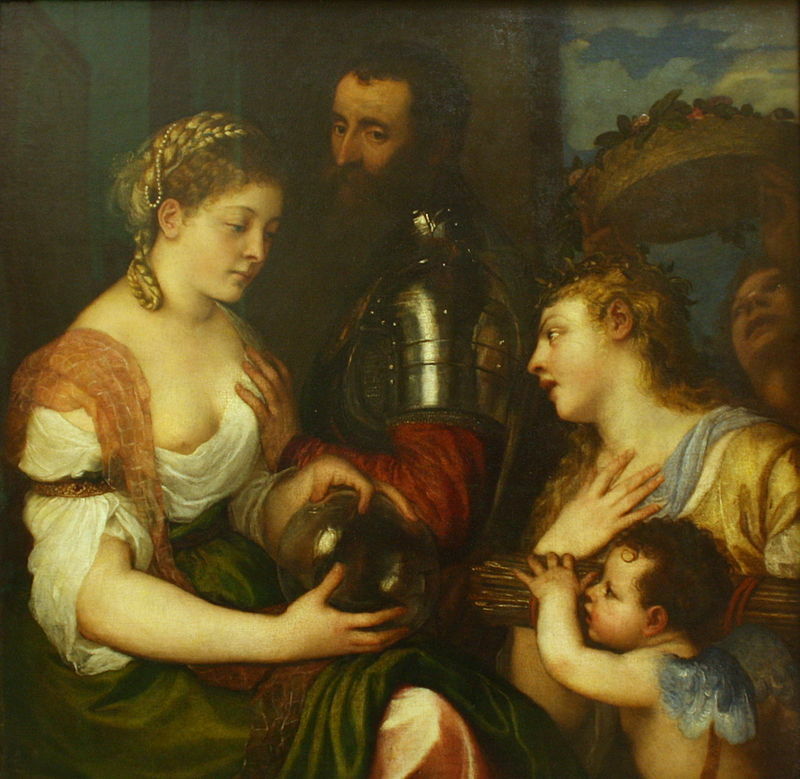 Paris, Louvre: “Allegory of Marriage”, Titian, 1533. It has found repetition for centuries. “first known “resurfacing” in the mid1830s in Scotland at Gosford House” – http://www.artic.edu/aic/collections/artwork/46314?search_no=6&index=4 ,retrieved Dec 29, 2014. On Titian and Vecellio family – Encyclopedia of Italian Renaissance & Mannerist Art, Volume II, edited by Jane Turner, Macmillan Reference Limited, 2000, p. 1695. For provenance since 1835 – see http://www.artic.edu/aic/collections/artwork/46314?search_no=6&index=4 ,retrieved Dec 29, 2014. “ready acclaim as a rediscovered Titian…”; “lent their Titian to The Art Institute to mount……”; “Cleveland… ‘Twentieth Anniversary Exhibition’ in 1936…” – “A Great Titian,” Bulletin of the Art Institute of Chicago (1907-1951) Vol. 31, No. 1 (Jan., 1937), p. 8; “Famed Titian Work Acquired by Chicagoans,” Chicago Tribune, October 20, 1936, p. 28; “The Mr. and Mrs. Charles H. Worcester Gift,” Daniel Catton Rich, Bulletin of the Art Institute of Chicago, Vol. 24, No. 3 (Mar., 1930), pp. 29-31 and 40. The Chicago collectors were Mr. and Mrs. Charles H. Worcester, a museum Vice-President and lumber and paper manufacturer. “…director of the museum… compared the work in importance to El Greco’s ‘Assumption of the Virgin’ and Rembrandt’s ‘Girl at the Open Half Door’” – “Famed Titian Work Acquired by Chicagoans,” Chicago Tribune, October 20, 1936, p. 28. “….Allegories were popular in Italian Renaissance art…”- http://www.iub.edu/~iuam/online_modules/iowc/b_003.html,retrieved December 29, 2014. “little of the technical brilliance or psychological revelations found in…Triple Mask…” – H. E. Wethey, The Paintings of Titian: Complete Edition, vol. 2, The Portraits, Phaidon, New York, p. 50. “its ‘very modern’ execution”; “in a mass” – The Wemyss Allegory in the Art Institute of Chicago, E. Tietze-Conrat. The Art Bulletin Vol. 27, No. 4 (Dec., 1945), p. 269. “It was widely known the pair excluded all three from their Titian catalog…” – “A Great Titian Goes to Chicago,” Art News 35, 5 (1936), p.15 (ill.). “Chicago museum research in the late 1930s was aware of Crowe and Cavalcaselle’s attributive work… overlooked their conclusions…” – Footnote #4, The Wemyss Allegory in the Art Institute of Chicago, E. Tietze-Conrat. The Art Bulletin Vol. 27, No. 4 (Dec., 1945), p. 269. “…restored by Sir Joshua Reynolds…” – The Wemyss Allegory in the Art Institute of Chicago, E. Tietze-Conrat. The Art Bulletin Vol. 27, No. 4 (Dec., 1945), p. 269. “done by Damiano Mazza…” Ibid., p. 270. Conjecture of Hans Tietze; Erika Tietze-Conrat’s postulation – Ibid., p. 271. This entry was posted in Art, CHICAGO, Italian Art and tagged 16th century art, allegorical painting, Allegory of d'Avalos, “Allegory of Venus and Cupid” (1600), ” Sir Joseph Archer Crowe, Cesare Vecellio, Chatsworth House., Damiano Mazza, El Greco “Assumption of the Virgin” (1577-79), Erika Tietze-Conrat, G.-B. Moroni, Giovanni Battista Cavalcaselle, Gosford House, Hans Tietze, Lord Wemyss, Rembrandt “Girl at the Open Half Door” (1645), Robert Harshe, The Art Institute of Chicago, The Education of Cupid, The Penitent Magdalene” (1531-33), The Wemyss “Allegory, Titian, Tiziano Vecellio, Triple Mask or Allegory of Prudence (1570), Venus with a Mirror (c. 1555) on December 30, 2014 by jwalsh2013.